We are now fully into solar maximum and the United Nations is taking steps to organize an international response to space weather effects. Space weather was added to the regular agenda of the COPUOS Science and Technical Subcommittee, which means the UN is recognizing solar activity equal to orbital debris and close-approaching asteroids. Now, space weather will be a matter of regular conversation among UN diplomats, scientists and emergency planners. The Committee on the Peaceful Uses of Outer Space was set up by the General Assembly in 1959 (resolution 1472 (XIV)) to review the scope of international cooperation in peaceful uses of outer space, to devise programmes in this field to be undertaken under United Nations auspices, to encourage continued research and the dissemination of information on outer space matters, and to study legal problems arising from the exploration of outer space. Space weather relates to changing environmental conditions in near-Earth space such as changes in the ambient plasma, magnetic fields, radiation and other matter in space. Much of space weather is driven by energy carried through interplanetary space by the solar wind from regions near the surface of the Sun and the Sun's atmosphere, some 93 million miles away from Earth. Sun is capable of producing strong solar storms which can knock out power, disable satellites, disrupt GPS and spacecraft signals, as well as long-distance radio signals. When a solar storm sweeps past Earth, waves of ionization ripple through Earth’s upper atmosphere, electric currents flow through the topsoil, and the whole planet's magnetic field begins to shake. Space weather can generate geomagnetically induced current, or ground induced current (GIC) which flows through the ground to depths of 20 km or more during geomagnetic storms. GIC was responsible for the collapse of the Hydro-Québec power network on March 13, 1989, accompanied by bright auroras as far south as Texas. This event started by a failure of an overloaded transformer, which led to a general blackout, which lasted more than 9 hours and affected 6 million people. The geomagnetic storm causing this event was itself the result of a Coronal Mass Ejection, ejected from the Sun four days earlier. GICs enter power grids, pipelines and other conducting networks through grounding wires. Pipelines and other activities at high latitudes are affected by GIC driven by modest levels of auroral activity which occur almost daily. 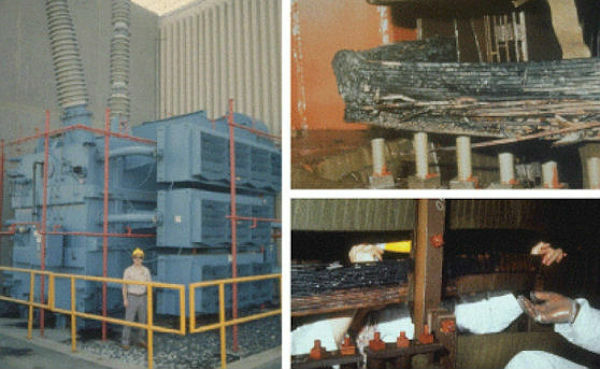 Ground induced currents generated by geomagnetic storms can damage transformers and increase corrosion in critical energy pipelines. Modern oil and gas drilling frequently involve directional drilling to tap oil and gas reservoirs deep in the Earth. This drilling technique depends on accurate positioning using global navigation systems. Solar energetic particles at the magnetic poles can force the re-routing of international airline flights resulting in delays and increased fuel consumption. The Wide Area Augmentation System (WAAS) operated by the Federal Aviation Administration is used as a precision navigation tool for commercial aviation in North America. It is disabled by every major space weather event. In some cases WAAS is disabled for minutes and in a few cases it has been disabled for a few days. Major space weather events can push the disturbed polar ionosphere 10° to 30° of latitude toward the equator and can cause large ionospheric gradients (changes in density over distance of 100's of km) at mid and low latitude. 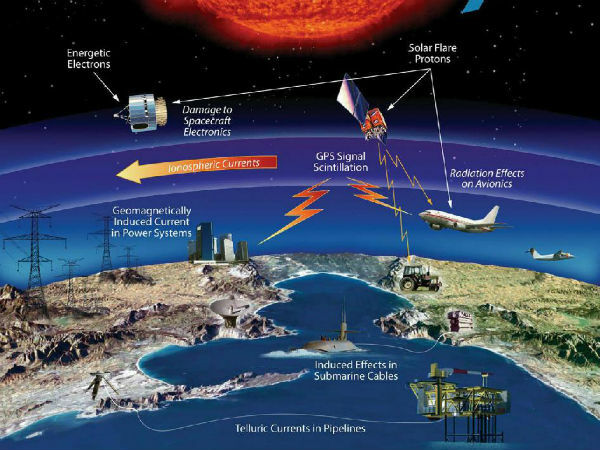 "Space weather is a significant natural hazard that requires global preparedness. This new agenda item links space science and space technology for the benefit of all humankind." Prof. Hans Haubold of the UN Office for Outer Space Affairs. Scientists warn that worldwide increasing reliance on sensitive electronic technologies make our civilisation even more vulnerable in terms of space weather adverse affect. Industrialized countries tend to have an abundance of monitoring stations. They can keep track of local magnetism, ground currents, and ionization, and provide the data to researchers. With assistance from the UN, researchers may be able to extend sensor networks into regions where it was once politically unfeasible, particularly at low latitudes around Earth's magnetic equator. The Maunder minimum, a 70-year period almost devoid of sunspots in the late 17th to early 18th century, coincided with prolonged, very cold winters in the northern hemisphere. Researchers are increasingly convinced that variations in solar activity have regional effects on climate and weather that pay no attention to national boundaries, and thus can only be studied in meaningful detail by international consortia. “The new permanent agenda item of the Science and Technology Subcommittee is an important opportunity to harness the effort of all Members to ensure coordinated global action” Terry Onsager of the United States’ National Oceanic and Atmospheric Administration (NOAA).